Art Direction: Who cares about cat people! Just get a giant long haired cat on there. Someday the world will know the glory of cats doing… stuff… but until then we’ll use one to sell books. Yeah, who’s scared of lions and tigers when we have Tiddles? There kitty, nice kitty, now just let Llyr into the corner so I can get my pants and I’ll leave the room all to you. I just read this book! Second or third time at least. Not exactly the same cover, but definitely had the big freakin’ kitty cat on it. At least the giant cat does appear in the story. I can has a tunic? I really liked these books but I never read the last one since I was worried everyone would die. No one else has done it, so I will happily conflate a couple of the earlier comments to get this: The Trouble With Tiddles. In the topmost blurb, I can’t help seeing TarZan (where it clearly says Taran). And finally… Big cat? Or little man? Who can tell? Good lord. Think of the hairballs. They’d be like disgusting pillows. Although I do think the giant cat flap is likely to be a major defensive flaw in the Castle of Llyr. Note how there is no furniture. Yeah there’s no furniture. Probably all clawed to splinters. Also, try moving that thing of a chair when it does’nt want to be moved. Haha, I kind of love this cover. Reminds of when I was a kid and would have my cat attack my GI Joe action figures. Hey you stupid little man, can’t you watch where you walk? Look what you did to my tail! One does not simply Tank Cat into Mordor. The mood, the shadow. It’s almost a Rembrandt. I wonder if canvas prints are available? 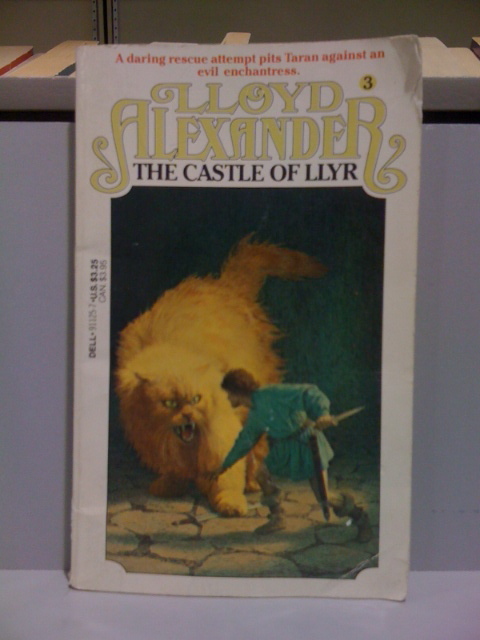 Man, I used to gobble up Lloyd Alexander books as a kid. Many of them contained cats (and also girls with ‘red-gold hair’, whatever that is). I don’t remember a giant, angry cat. @Tom Noir: Believe it or not, that’s an accurate scene from the book. The giant kitteh – Llyan – is the result of a moderately-successful “make-things-big” potion – and IIRC becomes the “steed” for one of the heroes for the remainder of the series. Yes I know I forgot to toss a dryer sheet in. But it’s not that bad. Really. You don’t look bad at all. What’s that? Stop smiling then? Oh I wish I could. Go ahead and eat me. You won’t look any less idiotic when you have. Has the cat been enlarged, or has the human been shrunk?